Kenzo Ito, anchorman at NHK, providing earthquake early warning information and response instructions to viewers on March 11, 2011 (courtesy wsj.com) View full video. One expects TV anchormen to stay cool under fire, whether in a heated political interview on live television, or when they report from a war zone. But the action of Kenzo Ito, an anchorman on the Japanese network, NHK, during the largest earthquake to strike Japan in modern times was outright übercool. During the afternoon debate in the Japanese parliament, known as the Diet, which NHK carried live on March 11, 2011, the giant magnitude 9.0 Tohoku Earthquake hit. Because the epicenter was a few hundred miles from the Parliament Building in Tokyo, the members of the Diet were not aware of the strong shaking in the northern part of Honshu which started when the initial earthquake waves arrived at the coast. However, several dozen seconds before the seismic waves were due to hit Tokyo, the NHK studios and their anchorman received a nationwide automatic earthquake warning, which had been issued by the computers of the Japanese Meteorological Agency, the official earthquake monitor in Japan. At first Ito's voice overrides the parliamentary debate, stating that strong shaking is expected in the northern prefectures of Honshu. Then the cameras switch from the Diet to the studio. In a calm voice he tells the TV viewers repeatedly to turn off gas stoves and take cover. Then, as a low rumble is heard in the background, the anchorman proclaims, still utterly calm and composed, that shaking has reached the TV studios in Tokyo. One can see how he holds on to his desk, still advising the viewers to stay calm and seek cover from falling objects. Finally, the producers switch to cameras outside of the studio which rattle due to the seismic waves, giving a wild impression of the shaking of buildings throughout Tokyo. The warning went not only to the TV studios, but millions of Japanese received the alert as well, on their cell phones, on billboards, via the radio and if properly equipped, on networked computers. 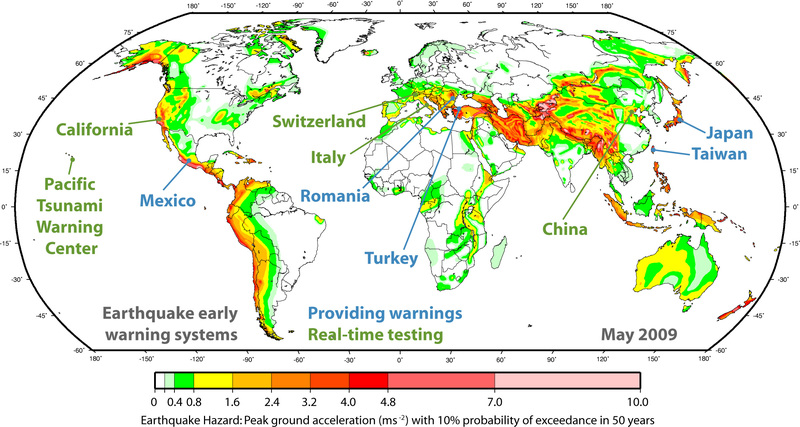 While the Japanese system is by far the most advanced early warning system, similar Earthquake Early Warning (EEW) systems have existed for years in Taiwan and in more rudimentary forms in Turkey, Mexico and Romania (The map below shows EEW around the world). Why is California, a state with a large potential for being struck by a devastating quake, lagging so far behind? After all, it was only in late September that Shake Alert, the EEW system for our State, was officially introduced and only as a demonstration system. The answer to why other countries are so far ahead, is very simple: We do not have more than a prototype because of a lack of political will on the Federal and State levels. 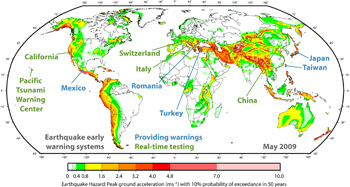 Many attempts over several years have been made by seismologists from different institutions to push for an EEW system but so far, their pleas have fallen largely on deaf ears in Washington and Sacramento. Although there is no doubt about the earthquake risk for all states along the West Coast, at this point, no influential politician has taken up the cause to establish an EEW.